Elaine’s newest release, REACH FOR THE STARS (2017), builds on themes of life and love that Mahon explored, through story and myth, in her 2013 release, RISE. However, in this new, cohesive collection of songs, Mahon subtly introduces her astronomical perspective in order to evoke wonder and offer hope and empowerment. A deft finger-style guitarist, Mahon employs alternate tunings to create a rich harmonic palette for the melodies of her songs which often take unexpected, yet pleasing turns. Add to that a sweet, resonant voice capable of expressing a wide range of emotion and you have a winning combination. Because she is as good at telling stories as she is at singing, the experience of listening to Elaine’s songs is much like watching an enjoyable film. With REACH FOR THE STARS Mahon invites her listeners to join her in a journey that starts on the soil we stand on and yet aspires to celestial beauty. Mahon began working on her first album, SEAMLESS, while employed as a postdoctoral assistant at the University of Florida. Near the completion of SEAMLESS, Mahon entered the world of the solo artist for the first time, performing her original songs at every opportunity in bars, coffee-shops and festivals around the state. Elaine was soon surprised by an unexpected but welcome pregnancy at the age of 39. SEAMLESS (2013) was released just weeks prior to the birth of Mahon’s son and her attention naturally turned to motherhood. As a result, SEAMLESS, though well reviewed, remained un-promoted. With the 2013 release of RISE, and now REACH FOR THE STARS (2017), Elaine offers us a generous gift of songs that evoke and transcend the tangible experience of life. Mahon performs solo at festivals, venues and house concerts in Florida and throughout the Southeastern US. Elaine has been accompanied on her songs by celebrated artists such as Joe Scott & Hannah Alkire of Acoustic Eidolon, Penny Nichols, Pierce Pettis, Richard Gilewitz and the Gatorbone Band. 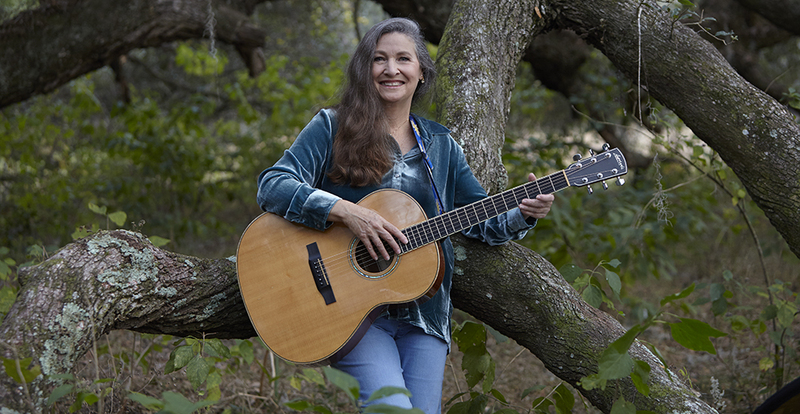 In addition to performing, Elaine is also founder and director of the Sandhill Stage acoustic music series in Gainesville, Florida which benefits two land conservation non-profits: Alachua Conservation Trust and Conservation Burial, Inc. Sandhill Stage quickly became a popular venue, and has hosted many top national and international acts. Mahon was born in Gainesville, Florida where, at an early age, she enjoyed listening to her mother and her aunts singing four-part harmony at family gatherings. Elaine began piano lessons at the age of nine, and later learned to play flute and piccolo while in her school’s marching band. On her sixteenth birthday Elaine received her first guitar, which she taught herself to play. In her early twenties Mahon began to write her first songs, but only as a hobby since she was working full time and attending community college at night. Mahon ultimately earned a doctorate in astronomy at the University of Florida, where she secured a post doctoral appointment. Mahon then left her academic career, reinvented herself as a songwriter, and now has three, well received albums to her credit. Elaine resides in her hometown of Gainesville with her husband of more than 30 years with whom she enjoys tennis, traveling, hiking, bird watching, canoeing and camping. Elaine Mahon may be reaching for the stars with her current release, but it’s clear that her feet are firmly planted on her beloved Mother Earth!